The tundra and the rivers come alive during summer, and so do radios. Throughout western Alaska, families who live in remote villages travel to even more isolated points to gather food for the coming long winter. In every one of these tiny fish camps, you�ll find a battery-powered radio, and you�ll probably find it turned on all day, tuned to KNOM. We thank you for providing these families the gift of being in touch with the outside world, and giving them all of the inspirational and educational services we broadcast, which they welcome into their camps. May God greatly bless you for your kindness! MAKING THE CUT (left): Using a computer, KNOM volunteer public affairs director Amy Flaherty edits an interview with a Nome teacher, trimming it to a 12-minute length for broadcast. From Cottage Grove, MN, the talented Amy is embarking on her second year as KNOM volunteer, producing daily news interviews as well as announcing the morning show Monday through Friday. LIGHT TOPIC: The longest day of the year, June 22nd, Nome sees the sun for 21 hours 31 minutes. It will be late August before the sky is dark enough to reveal a star. SPOTTED: Since January, KNOM has broadcast approximately 17,000 inspirational spots, and an equal number of educational ones. We are the oldest Catholic radio station in the United States, serving isolated villagers throughout western Alaska villages 24 hours a day, thanks to you. INSPIRATIONAL SPOT: All over the world, people travel to big cities to visit great art galleries, where they find famous paintings and statues that are kept locked up and under guard all night. We are so fortunate: All of nature is God�s art gallery, and it�s always open. top �PAIGE� TURNING: In May, it was an eye-opening visit to village Alaska for Secretary of Education Ron Paige, who learned that well-meaning federal laws don�t always make sense here. For one thing, new regulations allow for a student to transfer from a failing school to a better one, at school district expense. That might work in the Lower 48, but what�s a student from the village of Savoonga (sah-VOONG-gah) to do, with the next-nearest school an eight-hour round trip snowmobile ride? Further, the No Child Left Behind Act requires teachers to have a degree in the core subject they teach. There are eight core subjects, and in rural Alaska, many schools have only three teachers. Savoonga, with 686 Siberian Yupik Eskimos is located on the northern coast of St. Lawrence Island. KNOM volunteer news reporter Julia Dunlap covered the Secretary�s trip for our listeners. NO FLY ZONE: Nome is more than 500 miles from the nearest highway, not just at the end of the road but �far off the end of the road.� We�re entirely dependent upon airplanes. It�s not unusual for late spring fog to roll in off the ocean and disable air travel. That happened in late May, canceling many flights and disrupting passengers, freight and mail. It was nowhere near the recent record of five days in a row, set in August 2001, but still troublesome. 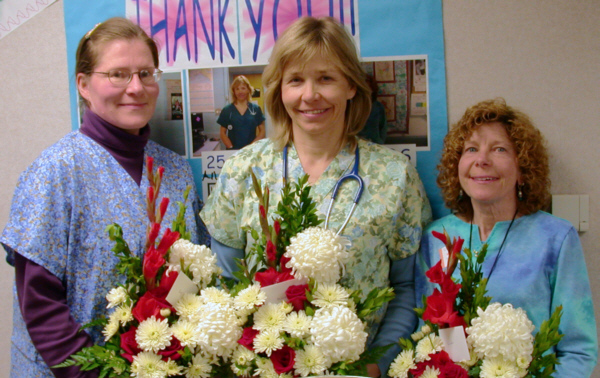 STAYING POWER (left): During National Nurse Week, Norton Sound Health Corporation honored three nurses, each of whom has dedicated more than twenty years of service to the Nome hospital. From left, the three are Terry Romenesko, Annie Blandford and Linda Peters. All three came to the hospital as KNOM volunteers whose salaries supported the radio mission. 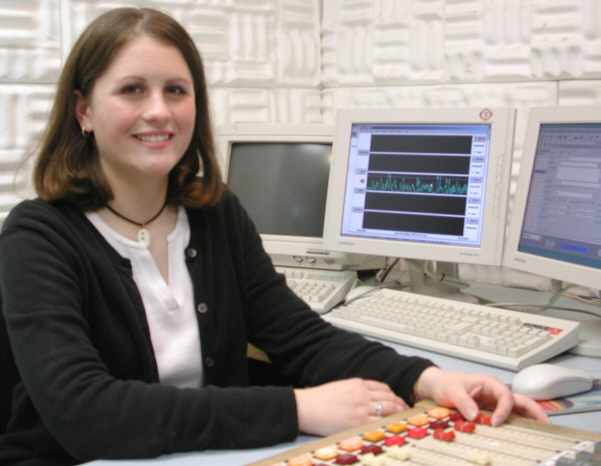 Over the years, a total of 71 generous men and women kept KNOM on the air in this way. During the 1970s and 1980s, their gifts amounted to 70% of the station�s operating income. We salute them and thank them! top GODSPEED (left): The morning of June 2nd we bid farewell to KNOM production director Mike Nurse. After four years here, the first two as a volunteer, Mike is moving to Seattle to study alternative medicine. We will miss him both professionally and personally, and we know that you join us in praying for a happy, successful future for this talented and caring man. God bless you, Mike! VEGGING (left): You can see why we don�t eat much fresh produce in Nome. Buying salad fixings for a farewell picnic for Mike Nurse (along with 18 eggs and three bananas for home), Florence Busch was horrified at the price. $2.19 for one large onion? 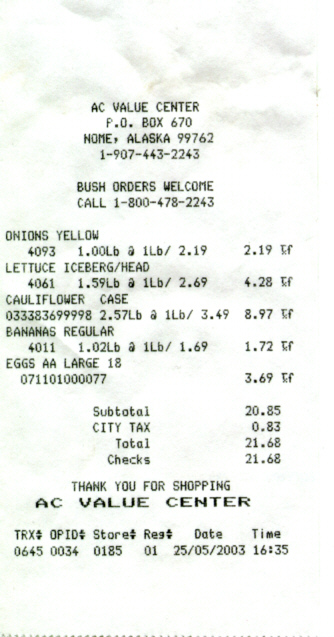 $4.28 for one head of lettuce? $8.97 for one head of cauliflower? As you know, almost all of Nome�s food must be shipped by air, and the spoilage rate is very high. It�s one of those things that we must live with. �OX� AND YOU SHALL RECEIVE: Just off the gravel Kougarok (KOO-gah-rok) Road about 10 miles north of Nome, early June brought views of a half-dozen baby musk oxen, protected by a handful of adults. About twenty pounds at birth, these little critters will eventually grow to around 900 pounds. Closer to town, you could see a few hundred reindeer nursing young on the tundra. As the snow melted, sharp-eyed KNOM�ers also spotted a grizzly bear with two cubs and several moose with calves. It�s that time of year! INSPIRATIONAL SPOT: Never compare yourself to another. You were formed with great precision. INSPIRATIONAL SPOT: Christ said that anyone who receives one little child in His Name, receives Him. Thank you, Lord, for parents who adopt. 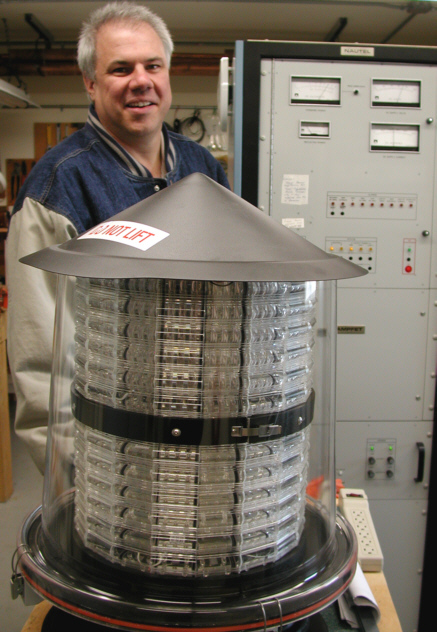 top BRIGHT IDEA (left): program director Ric Schmidt inspects our new Light Emitting Diode beacon, awaiting a tower crew to install it at the top of our 230-foot tower. This new technology uses only 10% the electricity of our 32-year-old unit, which needs replacement. Costing $3,227.90, the beacon and two side lights were to be installed in June. The total cost of this and other needed tower work (we may need spot welding between sections of tower) might exceed $30,000. 30 YEARS AGO: In June 1973, just shy of two years on the air, KNOM asked for help in paying for a food shipment on an oceangoing barge from Seattle, mostly canned goods. The station made such orders until 1993, cutting the mission�s food costs in half. 1973�s food bill for the volunteers, including freight, was expected to top $15,000, all of which needed to be paid up front. REPEAT? All thirteen of KNOM�s applications for �translator� transmitters in distant villages were unopposed. According to consulting engineer Jack Mullaney, we can expect to fill out more paperwork in two to six months, and receive permission to build these little auxiliary stations in a year or two. Please add Jack, as well as attorney Chris Ornelas, and the senior partner in Chris� law firm, Lee Knauer, to your prayers, won�t you? Over the course of many years, these busy professionals have never charged our mission for their services, saving us many tens of thousands of dollars. BUSTING THEIR BUTTONS: On a road trip following their daughter�s college graduation in Montana, Tom and Florence Busch were driving through the darkness in eastern Wyoming. As you can imagine, there aren�t many radio signals in that sparsely-populated region. They happened to tune to KOA in Denver. Who was delivering a ten-minute newscast? 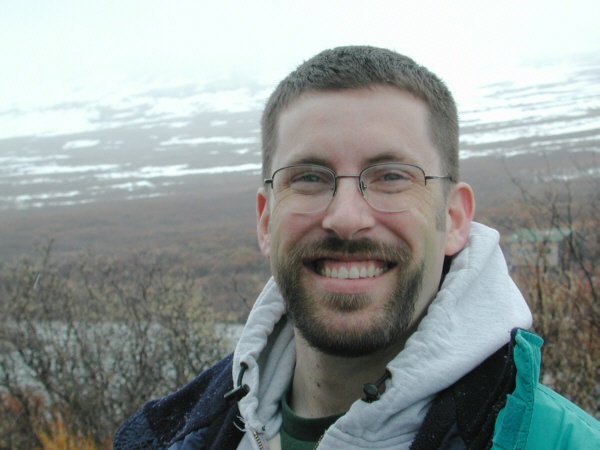 It was John Hall, 2001-2 KNOM volunteer news reporter! All of a sudden, we�re out of space! Thank you very, very much. We keep you and your intentions in our daily prayers. May God bless you and everyone you love.